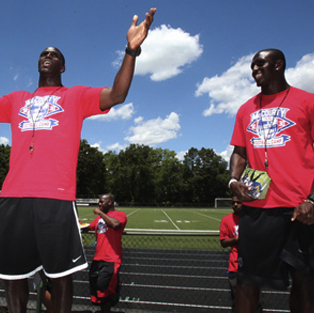 Jason & Devin McCourty are twin brothers, who were football standouts at Rutgers University and are both currently starting defensive backs in the NFL. Devin plays for the New England Patriots while Jason plays for the Tennessee Titans. Each brother has found individual success in the NFL. Jason led all NFL cornerbacks in tackles this past season with the Titans, while Devin made the Pro Bowl as a rookie in 2011 and played in the Super Bowl last year with the Patriots. “Growing up we were very close to our aunt Winifred and she battles with the disease daily going through many trials and tribulations. Her passion to keep fighting through everything that comes her way has driven us to try to make a difference and draw awareness to the terrible disease” added Jason. “This is something very personal to us, we can’t wait to get started and we’re thrilled to be working with Embrace Kids Foundation,” added Devin.